Journal of Environmental Risk Assessment and Remediation provides a resource for professionals researching and assessing environmental threats to both Homo sapiens and ecological systems. The editors believe papers published to be original, of sound science, purposeful for risk analysis (valuation, communication, management) and related areas, well written (in English), and a contribution to the scientific works. The journal's emphasis is on publication of papers that contribute to improvements in human and environmental health. Analysis and mapping of natural processes. Pollution Management, Pollution Control, Waste Management. Review and Strategy for policy making. Formulation of national/international environmental protection policy. Comparative legal aspects of pollution. Assessment of risks from water, soil and air pollution; effective and viable remedies. Protection of soil and groundwater. Stochastic atmospheric and climate processes. Air pollution and quality assessment research. Mechanisms of pollutant formation, emission, exposure and absorption. Physical, chemical and biological analysis of human exposure from single and multiple media and routes; control and protection. Probabilistic methods in ecology and population biology. Models using stochastic differential equations stochastic or partial differential equations. Environmental risk assessment, consistency analysis and decision making. Surface and subsurface hydrology and hydraulics. Multiphase porous media domains and contaminant transport modelling. 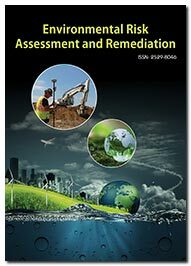 The Aim of the journal 'Environmental Risk Assessment and Remediation' is to accommodate an accurate advice average to altercate the absolute advancements in the area of environmental risk. This account aims to accumulate and assets precise, specific, abundant manuscripts on the environmental scope. This Journal is a scientific open access one meant for the valuable researches and many developmental activities in the scientific community. It includes all the aspects in environmental sciences. Manuscripts are recommended from all the studies related to environment risk including basic ecology systems including all vegetation, animals, microorganisms, rocks, atmosphere and natural phenomena that occur within their boundaries. It includes universal natural resources and physical phenomena that lack clear-cut boundaries, such as air, water, and climate, as well as energy, radiation, electric charge, and magnetism, not originating from human activity. Journal produces the valued manuscripts under its scope with valued scientific information.